You’ve written an amazing blog post. You’ve published it on your awesome blog. Why is nobody reading it? Do you promote your articles with email? Email marketing is still one of the most effective methods of directly communicating with your readership (and customers). Pump up your great email list with social contests, RSS feeds and opt-in pop ups. Then generate awesome emails to drive tons of traffic to your blog posts. In this article, I give you 12 actionable tips you can start using today to drive traffic to your blog. You probably already host social campaigns like contests and sweepstakes. Most socially savvy businesses do. 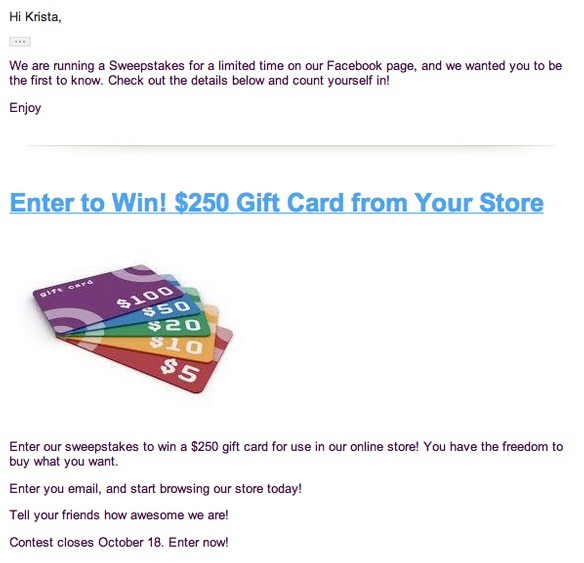 Social contests not only spread the reach of your brand, but they’re also a very cool way to collect emails. Host a sweepstakes on your Facebook, Twitter, or even your blog. Ask for an email as a simple way to enter. You can even generate more motivation to spread the word about your offer by running a referral campaign- giving people deals for getting their friends to give you their emails too! Here’s an example of what a referral campaign looks like on Facebook. You can easily use a third party app (ok, like Wishpond) to set up email-gated contests and expand your lead generations. There’s many more cool and effective ways to get emails through your social platforms, too. 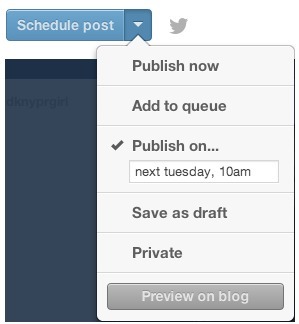 You can include a link to your blog in all your social media profiles. You can post email-gated content like webinars, ebooks, and coupons. 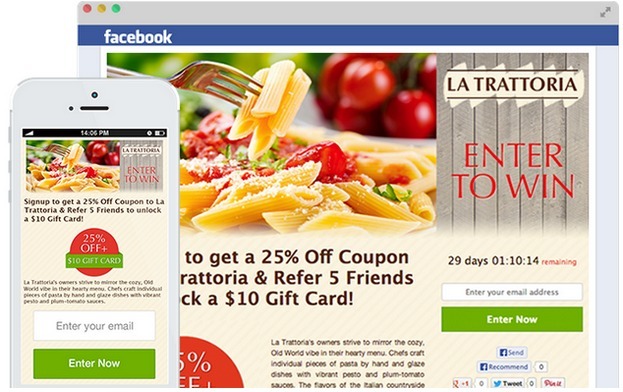 You can make a Facebook tab for email signups, and incentivise it with exclusive offers. 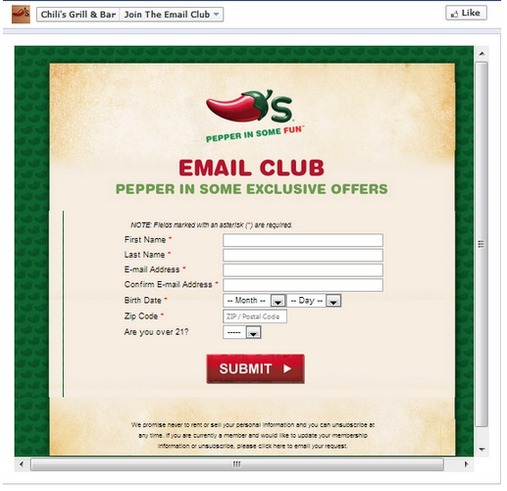 Chili’s Grill and Bar uses email gated content of their Facebook page. They make it enticing for Fans to receive regular emails by joining the club to get exclusive offers. Make it with contrasting colours, and keep it highly visible near the top of your page. Here’s our simple and clean RSS subscription at the Wishpond blog. Yes, newsletter pop-ups can be annoying. But they can work to increase your email subscribers. In fact they work so well, that most blog sites - from big business sites to single blogger - use them. Implement your pop-up effectively by choosing the right placement, and by using an optimized popup builder. Give reasons for why your site visitors need your newsletters, and how your stuff will benefit their life or make their business more profitable. Use words like “free” or “exclusive content” and you’ll generate more sign up. Keep your tone friendly. It makes your invasion a welcome one. Check out Kristi Hinesand Unbounce for more views on newsletter pop-ups. 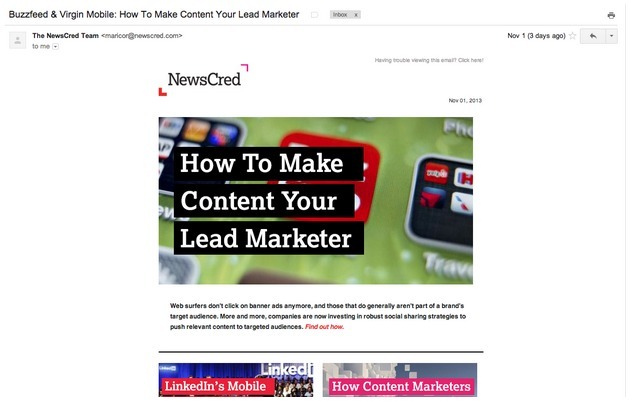 NewsCred uses pop-up email sign ups. They use a personal touch with “hi”, and explain what you’ll get by giving your email. Email popups can be annoying, but they work - and are commonly used by both big and small business. Time your popups so only people who are interested in your site for a longer time get the offer. Make your popups friendly, and informative to increase your signup results. You use your email to get in touch with lots of people. Use your email signature to get lots of people clicking through to your blog. 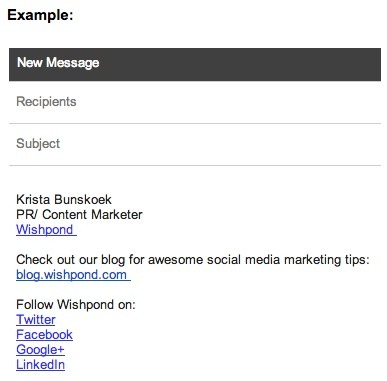 Make a friendly call to action in your email signature, inviting contacts to visit your blog. Give a brief benefit to motivate action - such as what your blog’s about. Include an easy to click link. Here’s my email signature. I’ve included a brief description of the Wishpond blog, and a link to our blog page. Ok, now that you’ve got a robust email list - people will be clicking through to your blog in droves, right? Not quite. To get your emails opened, read and clicked through you need to stand out, connect with your readers, and beat out your content competitors. Here’s seven tips you need to implement to get your message heard. Your subject line is the make or break for people to even read your message. Spend time crafting your line. Keep it short, to the point, and include a quick Call to Action (CTA). Use marketing tips like asking a question, creating a sense of urgency, creating a fearful state of disbelief, or conveying a great benefit your email will provide. A/B test your subjects, and use the one getting the most opens, reads and click-throughs with your potential readership. To get a click through to your blog or blog post, make your email content real. Stock, corporate, impersonal emails do not get results these days. Remember, you’re competing with tons of other emails in that inbox. Write emails as if you are sending your message to friends. Use the words “you” and “me” in your content. Strike a tone of dialogue that resonates with your demographics. Keep it professional, yet conversational. Deepen your relationship with your email subscribers by being real, and invite them to join you further - on your blog. Here’s a great email I recently got from Copyblogger. They start their email with a question, and ask for your opinion. How could you not love that? 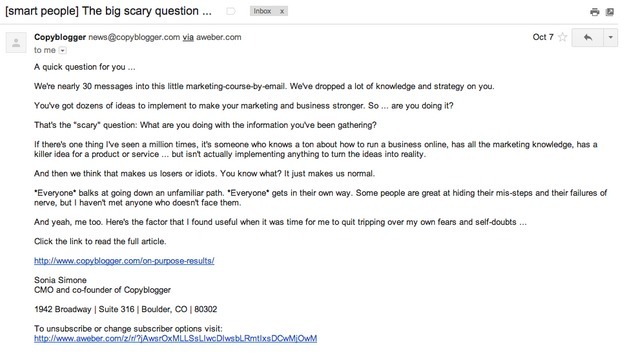 Additionally, the email is from Sonia herself at Copyblogger. Treat your customer online like you would your customer offline, by speaking to them like a friend. If your blog article is related to their business, mention their business name, and how the post will benefit them. Click through rates of personalized emails increase by 14%, according to the Aberdeen Group. Here’s an example of a personalized contest email. Good contest apps can let you send out personalized emails with your own email lists, your lists on MailChimp, or your lists from previous contest entrants. Personalized emails improve click through rates by 14%. Segment your robust email list into targeted groups based on your business needs. Strategically send out blog articles and newsletters to those who would most read it. You can even craft different emails and newsletters linking to the same blog article. For example, if you’re sending emails to your business suppliers, you’ll likely want to make them different than emails you are sending to your active customers. 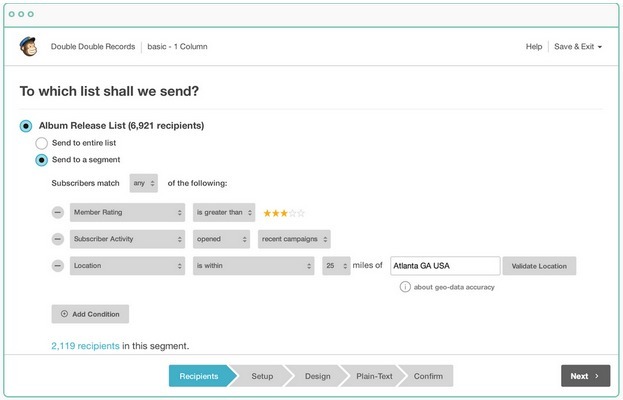 MailChimp enables you to segment your emails based on location, engagement and interests. Make it clear what your ask is in your emails. When you want people to click through to your blog article - ask them. Doing so increases your response rate results. Make it easy to act on your ask too. Ensure your blog post link is easy to click, and easy to see. You can even make coloured CTA buttons embedded into your email. There are many newsletter formatting sites (such as Stamplia, Fusion, and MailChimp) that make CTA buttons easy to create. Use them. 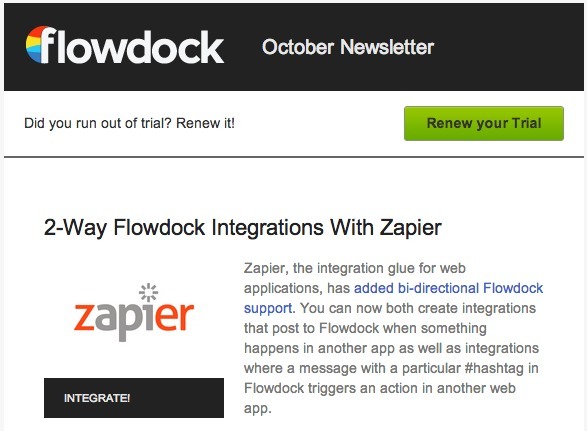 Flowdock sends out monthly newsletters, with clear CTA buttons. This both drives traffic to their blog, and increases business renewals. Use newsletter formatting sites like Stamplia, Fusion, MailChimp, etc. to create professional looking buttons for your CTAs. Make a consistent scheduling calendar for your blog article publications. This not only makes it easier for you to keep track of when you need more content, the real benefit is for your readership. Send regular articles to people who’ve signed up for your RSS feeds by posting regularly. This can form a habit in your readership, develop familiarity, and deepen trust with your business as people get to know when to expect your next blog articles. 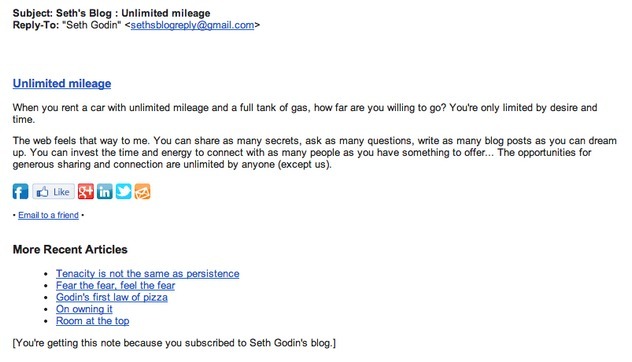 Seth Godin publishes article every day, and at the same time. His short pieces of inspiration land in my email inbox daily. You like visual information, right? So do your readers. Entice them to click through to your blog with image rich newsletters. Include summaries of articles, that get your main point across - but end the summary with a teaser and a clickable “read more” link or button. NewsCred is brilliant at sending out visually appealing teasers of their blog posts. Each newspaper like section gives an enticing teaser of the article, with a simple red link to their website. 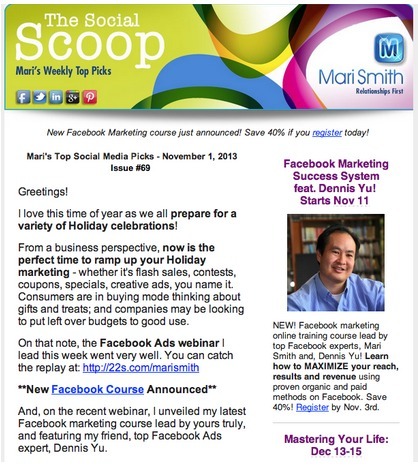 Mari Smith’s weekly newsletter includes links directly to Mari’s blog, as well as top articles in social media from other blogs. Email marketing is a very effective method in getting your blog articles seen and clicked on. Use these tips to grow your email list, and to create powerful emails that will outperform, and get you those clicks to your blog. What do you think? 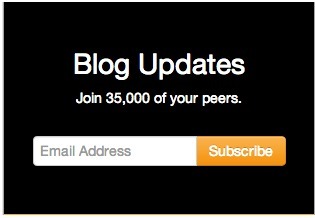 Do you use email to increase blog readership? What’s worked for you? Share your tips, and results in the comments, below.